This briefing in pdf format can be downloaded here (Spanish). 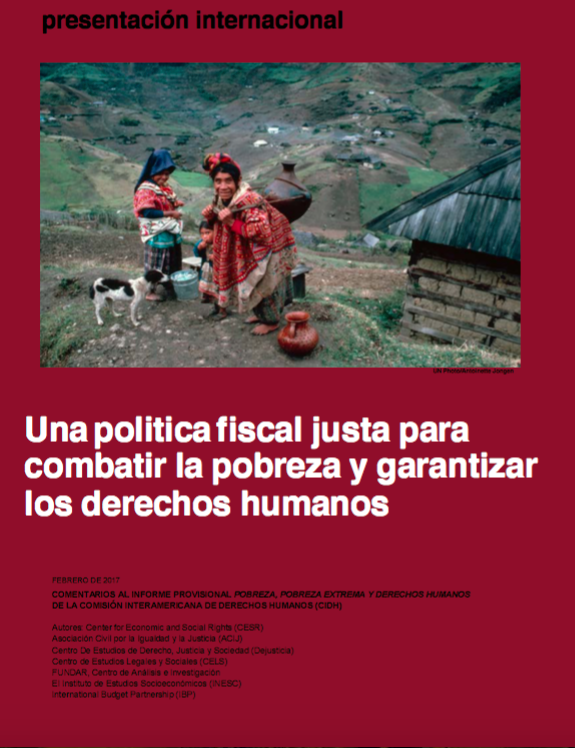 In 2017, a coalition coordinated by CESR and comprised of Asociación Civil por la Igualdad y la Justicia (ACIJ), Dejusticia, Fundar, Centro de Estudios Legales y Sociales (CELS), Instituto de Estudos Socioeconômicos (INESC) and International Budget Partnership (IBP), sent a briefing to the Inter-American Commission on Human Rights (IACHR), indicating the relevance of fiscal policies for reducing poverty and human rights violations in the Americas. Drawing on this briefing, the IACHR later included a special section in its report on Poverty and Human Rights in the Americas, analyzing fiscal policies and recognizing their centrality to its own agenda. In April 2019, Kate Donald (the Director of CESR’s Economic and Social Policy program) attended the IMF/World Bank Spring Meetings in Washington, DC. CESR participated actively in the 2019 Commission on the Status of Women at the United Nations HQ in New York. The priority theme of this year’s Commission was "social protection systems, access to public services and sustainable infrastructure for gender equality." In late February 2019, Kate Donald (the Director of CESR’s Economic and Social Policy program) participated in an expert meeting organized by UN Women, the United Nations Office on Drugs and Crime, and the UNFCCC Secretariat in Vienna, Austria.